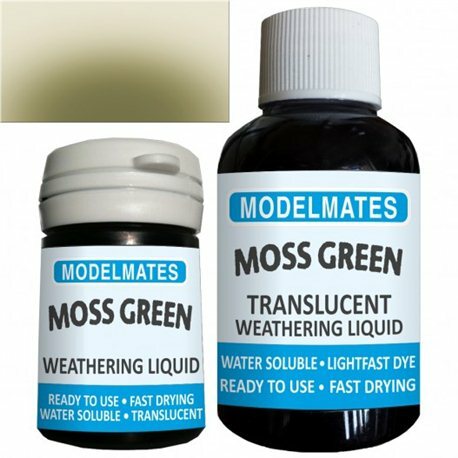 Translucent Weathering Liquid – not very visible on dark surfaces. Colour: Dirty green colour. Great dirty moss colour that looks particularly good on buildings around gutters, pipework and at ground level. Best used undiluted on building, but can be diluted for a subtle green shade. Apply neat, straight from the pot using a paint brush or air brush spray. Thin with water or Modelmates Translucent thinning liquid. Apply to a non-porous surface such as plastic, let dry, and then wipe using a damp cotton bud or tissue (kitchen roll), to create great weathered effects. (Dye will permanently stain porous surfaces). Can be made permanent by sealing with a fine acrylic fixative spray. Apply fine, mist coats so as not to dissolve the dye. Mixes with all other translucent weathering liquids.